How many hours you guys have on your outboard engines? 2 stroke or 4 stroke. I had a used Yamaha 150 Vmax that blew up on me at around 500 hours, probably because I ran it like a bat out of hell. Also had a 90 yamaha 2 stroke that I got used for a year and it had over 700 hours when I bought it and never gave me any issues before selling it. But, now I've got a Honda 225 and I brought it into the shop in the fall to get the 10 year service done: thermostats, oxygen sensors, other sensors, etc.. and the printout from the computer said I was just over 1000 hours. With only 4 hours at WOT. Safe to say I learned my lesson on running them hard. I don’t think it matters if they’re run hard or not. Some outboards actually last longer if they’re run hard. That being said, outboards that are used often last way longer than ones that sit up for months at a time unused. I don’t think it matters if they’re run hard or not. Tend to agree with this. Will say that if you are under powered and run hard your engine won’t last nearly as long. we had a 75hp Yamaha growing up, i wish i know how many hours it had. we ran the piss out of that motor. I had a 150 HP vmax that had about 100 hours on it hen i sold it. i never had any problems with it. Reds, what kind of boat you running with that 200? 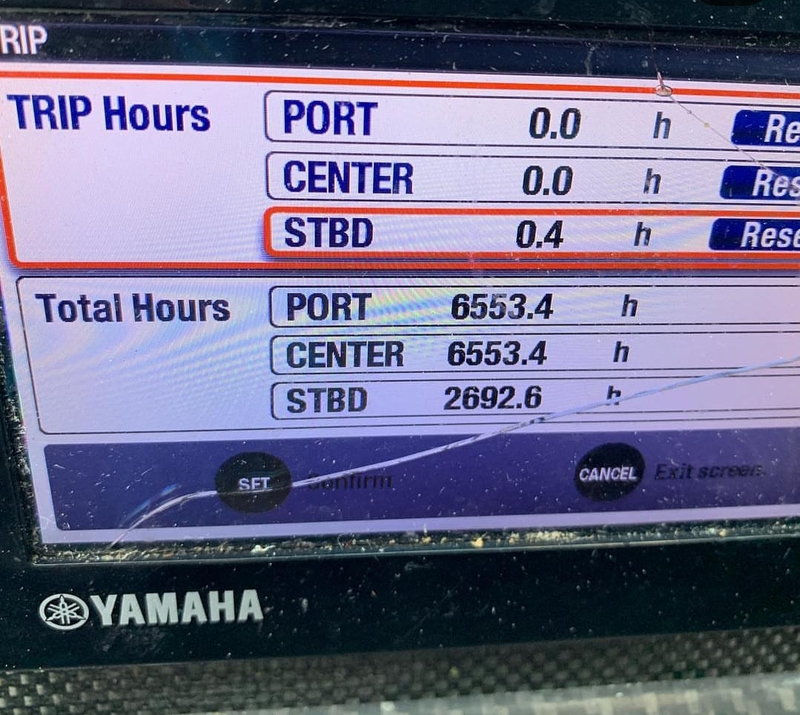 Offshore charter I fish with has 7k hours on Yamaha 350's. Granted offshore hours are different than fishing hours due to idle time but still a ton on motors that get trashed alot. He's meticulous about maintenance. I have no clue how many hours I have on mine, it's an 07 Yamaha 90 2 stroke. We had a work boat at my previous job that had 225 Salwater Series Yamaha with only 5,200 hours on it before it shite the bed. 1990 Mercury 115 2 stroke. I've had it for 2 years. Aside from occasionally getting overzealous and flooding/overpriming/choking at initial startup....it cranks and runs like a dream every time. Probably has at least a million hours. I agree with other posters comments about it not being an issue "running them hard" provided you're not going over the max RPM at WOT. I run my engine WOT all the time but with 2-3 people and gear I'm only at 5200-5300 RPMs (engine max is 5750). Only time I've come close to 5750 is with low fuel, no gear, and only myself in the boat. Nope, now over prop that under powered motor and run it hard there will be problems. WOT in the rpm range is the same under/overpowered boats. I am under propped right now waiting for the right prop one to come up used, need a 21p rev 4 if anyone has one. 220 hours 2012 Opti proxs 250, bought used with 184 on the clock with zero warranty repairs per merc. Outboards don't like to sit, I know the Capt. I fish with in Venice trades his 350's in every 5 years and they have over 5K hrs.